whose Banners and Icons have travelled throughout the world, celebrating the Divine Feminine, including the "Goddess of Gobekli Tepe", a 12,000 year old prehistoric site in Turkey. This series was aired by the BBC, interestingly, never aired in the U.S. It's exciting to see this information brought to the public in this way, although I confess I had a hard time with the title (would anyone talking about Western religion title it "When God Was A Boy? ".......worth thinking about.) And I never heard her mention archeologist Marija Gimbutas, who, along with her colleagues, developed the field of Archeomythology, and wrote the monumental THE WORLD OF THE GODDESS. To talk of Goddess culture and theory without mentioning Gimbutas is kind of like talking about psychology and failing to mention Freud or Jung. Never the less, although I find it somewhat "dumbed down", I have after all spent 25 years studying the subject, and like most scholars, have a hard time when the information is incomplete or simplified. This subject was probably something quite new to this journalist, and I'm grateful she made the documentary and got some of these ideas out there. The famous 1989 Trilogy "Goddess Remembered" by Canadian Film Board Director Donna Read is a poetic, in-depth look at re-claiming of the Goddess in contemporary times, and features interviews with Merlin Stone, Carol Christ, Luisah Teish, Starhawk, Charlene Spretnak, and Jean Bolen, who link the loss of goddess-centred societies with today's environmental crisis. They propose a return to the belief in an interconnected life system, with respect for the earth and the female, as fundamental to our survival. My next post will share something about that work for any who may not be familiar with it. Ok, I can't help myself. I'm in a UTube kind of full moon mood. There's a big difference between the intelligent existentialism of a cat like, say, Henri, and dogs. I'm a cat person, but I have to admit, this Jack Russell Terrier would come in handy. Thousand Hand Guan Yin-"Avalokitesvara Bodhisattva is an astonishing performance in celebration of the Goddess of Compassion, Quan Yin. It is even more astonishing when one learns that this Chinese production was performed by deaf and blind performers. Quan Yin, like Tara, is the embodiment of infinite mercy and assistance to all who call on her. She is "She who hears the cries of the world". Avalokitesvara means "Lord/Lady who looks down", a Bodhisattva who embodies compassion. Kuan Yin has a thousand arms with which to scatter blessings, a thousand arms with which to bring help to those in need. What an amazing invocation these performers make! Rock Hudson: "How should we live?" Martian: "Anyone with eyes can see the way to live." 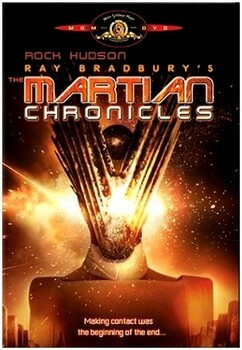 Martian: "By watching life, observing nature, and cooperating with it. By living life for itself, don't your see? Deriving pleasure from the gift of pure being. Life is its own answer. Accept it and enjoy it day by day. Live as well as possible. Expect no more. Destroy nothing, humble nothing, look for fault in nothing, leave unsullied and untouched all that is beautiful. Hold that which lives in all reverence, for life is given by the sovereign of our universe, given to be savored, to be respected. But that’s no secret." 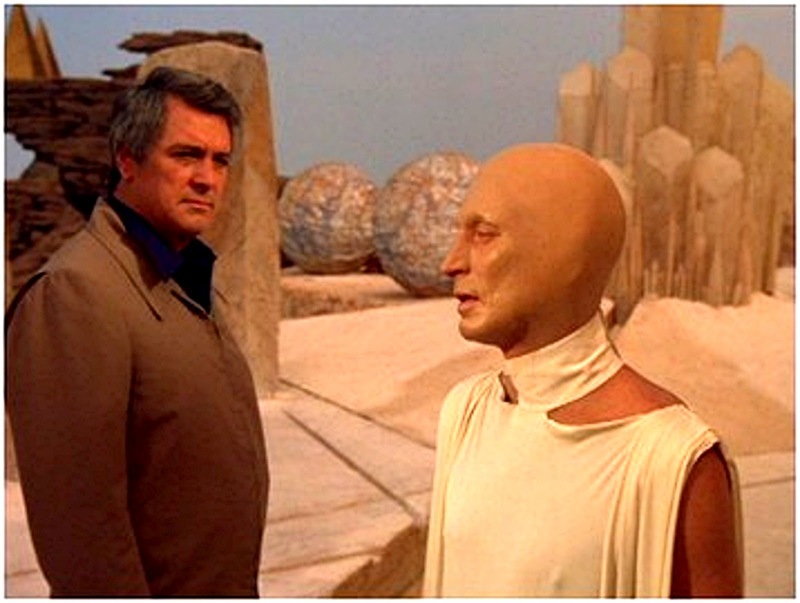 From THE MARTIAN CHRONICLES, 1979. 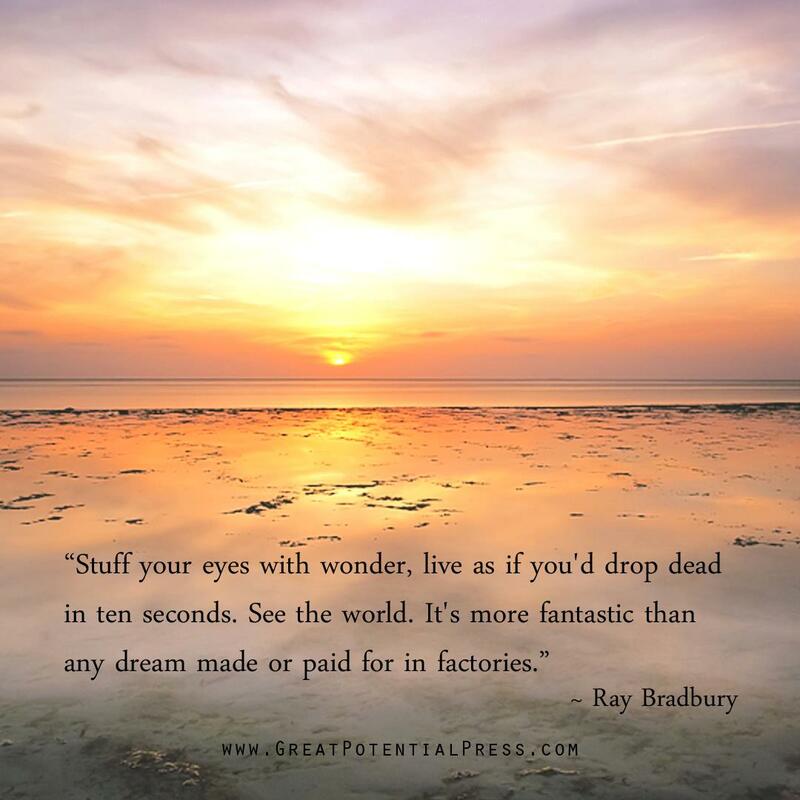 I miss Ray Bradbury. I miss when aliens were wise beings more evolved than us. I've always loved this quote from the movie. the divine will rush up bringing great bounty with it." Here's one of my favorite Green artists. His medium? People! His canvas? The Earth! I take the liberty of copying below from his website. Daniel Dancer, who lives in Oregon, became fascinated with sky art while traveling in South America in the 80's and encountering the Nazca Lines of Peru. 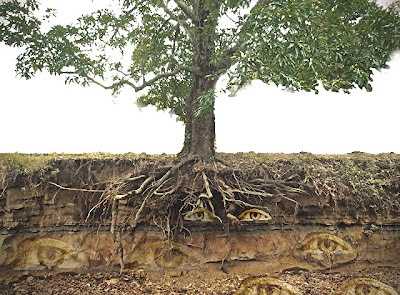 When he returned home, he began working with Kansas field artist, Stan Herd, who creates giant images on the Earth by using a tractor as a paint brush and crops for color. One day, Daniel decided to bring an entire elementary school out to perform as beads on the headband of a 25 acre Indian head. . A decade later the parents of one of the "bead kids" told him that the experience taught him that things aren't always as they seem . . . that a Big Picture View of the world is really important! 450 children perform as "beads" on headband of "The Native American,"
Dancer's decade long photography work with Stan became the material for a five-year touring show with Exhibits USA called Fields in Focus: Art For the Sky, and a book called Crop Art and Other Earth Works. Daniel's fascination with developing humanity's big picture vision led him to work with Lighthawk (the environmental air force) aerially documenting the human impacts upon the natural world. His interest guided him across the continent in the creation of varied found art works upon the Earth that made the most sense when viewed from above. Believing that "only from the sky can we truly understand our rightful fit in the world," Daniel's mission is to awaken what he calls "sky-sightedness". To awaken this way of seeing the world he founded Art For the Sky in 2000. 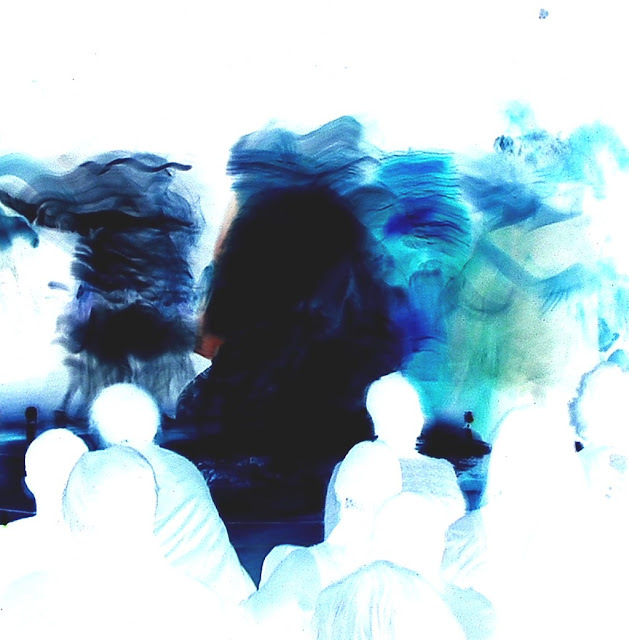 Daniel's work as a conceptual artist and educator has been shaped by his travels worldwide in search of styles of being that engender happiness and sustainability. His striking images of beauty and destruction have been published in hundreds of publications worldwide and viewed in galleries across America. It is precisely this interface between wild nature and devastation that most greatly informs his work and which led him to try to reach as many people as possible through sky art. 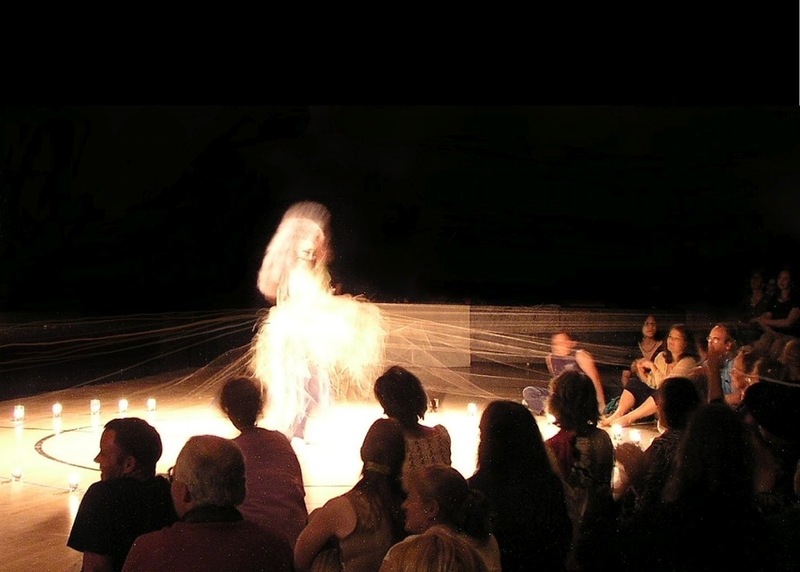 Working with communities from Alaska to Australia Dancer has documented his work in various ways. 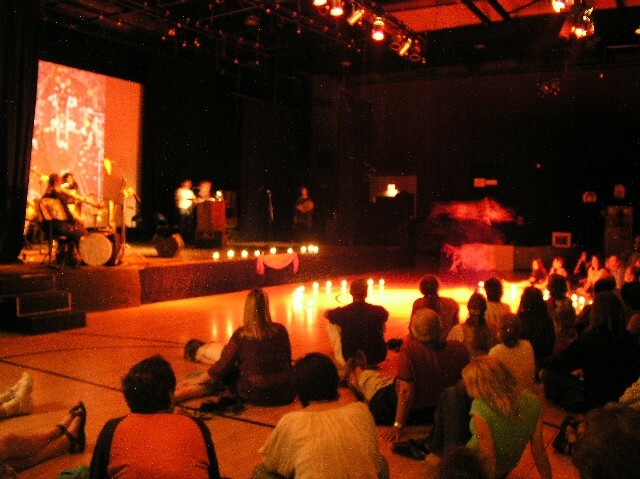 An Exhibits USA tour called Sacred Ground-Sacred Sky: An Eco-Experience became their second most requested show in its five year tour across the country. This 32 picture educational exhibit is currently seeking a permanent home where it can be on public display. All of Dancer's work to date is documented in his book, DESPERATE PRAYERS: A Quest for Sense in a Senseless Time. Dancer is the founder of Rowena Wilds, a 200 acre, eco-community near Hood River, Oregon where he lives in his Earth-sheltered home built of recycled and Earth friendly materials. and evolved and will help lead people into harmony with the planet and one another. This is the first image where people play "themselves" rather than pixels on something else." form a polar bear standing on an tiny iceberg floating in the ocean . . . an iconic representataion of global warming. Maryland's Governor O'Malley is the lone man on the ice. The 350 in red is the number climate scientists say is the maximum parts per million of greenhouse gasses we can have in our atmosphere. It is now 390 and going up. An endangered marbled murrelet made with 1000 students and teachers swims in a sea made of 1500 pairs of blue jeans and icebergs made of sheets. The 350 signifies the maximum parts per million of carbon we can have in our atmosphere to survive global warming. A humpback whale made of bark chips and sand was built for the finale of the 5 Lands Walk. This annual festival is a 10K "walkabout" along a coastal path that knits five communities together in celebration of nature at the height of the humpback whale migration. Butte College, California sustainability students depict a raven flying over Earth as the polar ice caps are melting. Raven has a message: Achieve a ceiling 350 parts per million of carbon in our atmosphere or risk climate catastrophe. Fall, 2009.
birds to the the soon to be restored Snowden Wetlands near White Salmon, WA. On February 28th, 2011 in Salt Lake City, Utah, activists took to the streets to sing, march and do sky art in a display of solidarity with Tim DeChristopher, aka "bidder 70", whose trial for civil disobedience in defense of Utah wilderness and climate justice began that day. 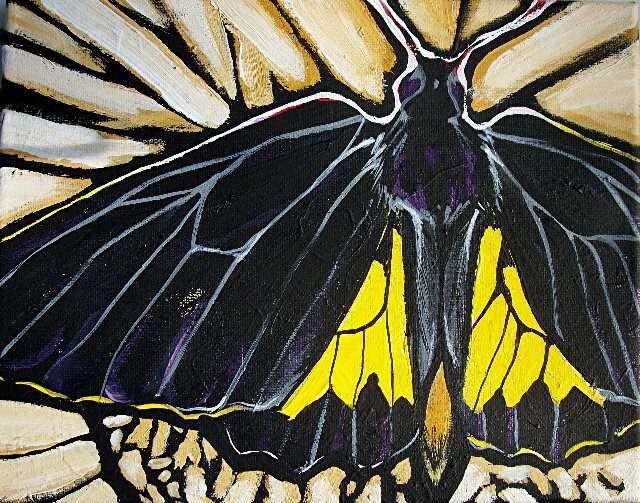 Daniel Dancer's book shares his travels as he creates healing art in ten endangered ecosystems. 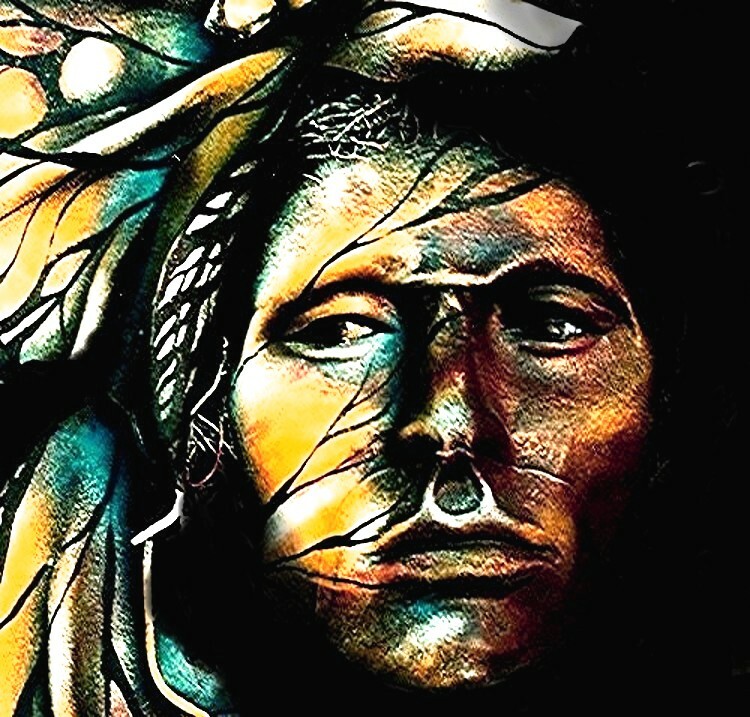 He reflects on spirituality, indigenous knowledge, quantum physics, psychology, and ecological principles. The result is a hopeful gift for apocalyptic times. Entertaining, and beautifully illustrated. We call on you now. Rise up from your roots. Hear us, our voices of pathos. With our hearts, we drum you back. I've been doing energy work that is about the ways we block ourselves with negative patterns....not just as ideas, but as unconscious fields, "resonance". I don't know how to describe the work, to be honest, except to say that it's come to me in a rather miraculous way. I thank Lonnie for her generosity! This past week she gave me some "homework". We were working on the way that I have, in the past ten years, shut down much of my psychic sensitivities, because of being in an unsupportative environment (family) as well as some negative experiences in the past. Living in a field of "unbelief" creates unbelief. But now it's time to open again, so that I can be more integral in all aspects of my life. Filtering experience through what we "believe" has a lot to do with what we actually experience (remember the old saying that to a thief, the greatest saint in the world is just a set of pockets?). Homework was to do something that "takes back power from not believing". I said that I would share my spirit photos, because they are one of the most extraordinary affirmations I've ever received. Taken at a performance/ritual called "Restoring the Balance" by photographer Anne Beam in 2004, I've always felt there was a reason they happened, and they were meant to be shared because spirit had something to say. But I've received all kinds of negative dismissals from people about them, including people who think I, or Anne, "photoshopped" them. I didn't, and I know Anne didn't either. 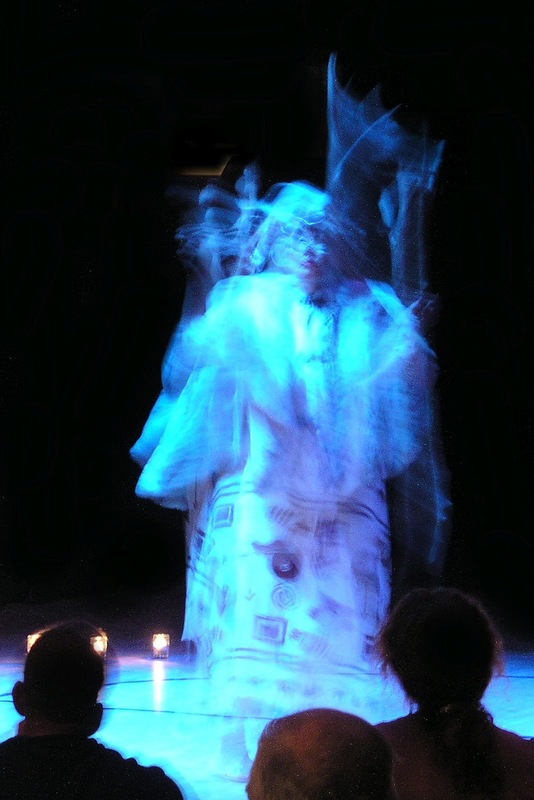 In this photo, Erica Swadley is performing the role of "Sedna's Shaman". In the rituals that are done for "restoring the Balance", prayers and confessions are "gathered" by a female shaman (Grey Eagle told me this), who then takes them to the suffering Sedna deep in the depths of the ocean. She brings the prayers and "promises to create a better life story" to her, and cleans her body from the filth that has fallen down upon her. She combs Sedna's long hair, and brings to her the love and regrets of her people, asking her to forgive them, thanking her for food and life, and to restore the balance. Erica, I believe, chose this role because she herself is an experienced shamanic practitioner and healer, as well as a poet. 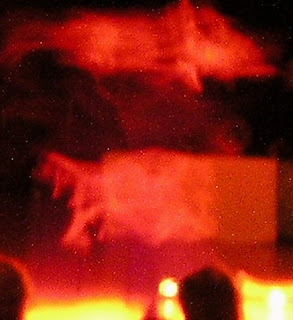 The photo shows her before the story begins, doing a prayer dance to invoke Sedna. Notice the strange, but beautiful, overlay of two faces in this photo. Erica is a white woman in her early 60's. The younger face, that seems to have white stripes painted on her cheeks, looks distinctly non-caucasion to me. It's not Erica's face, and I don't believe she was praying/dancing alone. notice how she seems to "disappear". Quynn Elizabeth performance and " emerging goat"
Last picture of dance for "Kali". A goat? This is the most striking photo.......you can see the back of Quynn's head and her back, and there is a "figure 8" shape, and in front of that what Anne and I decided had to be a goat. That seemed pretty bizarre, but later I thought about how in India goats and sheep were sacrificed to Kali when devotees went to pray. Perhaps, symbolically, Kali was accepting our "Offering", and provided us with a "goat". It looks even more like a face with high cheekbones. 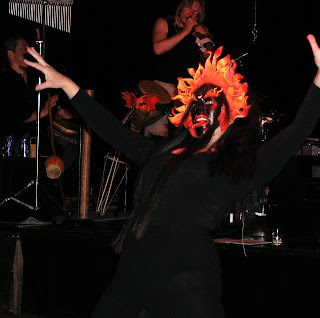 My favorite photos from the performance are those of dancer, Tarot instructor and Wiccan Priestess Morgana Canady performing the role of Spider Woman. 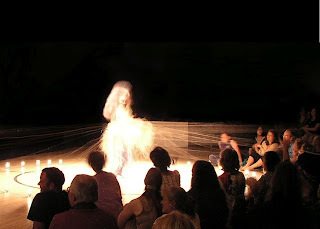 I used the story of Spider Woman, the great Weaver, to demonstrate the truth of interdependancy and interconnection as she wove a web (literally) with the audience from many cords that came from a "sacred hula hoop" she held around her waist. 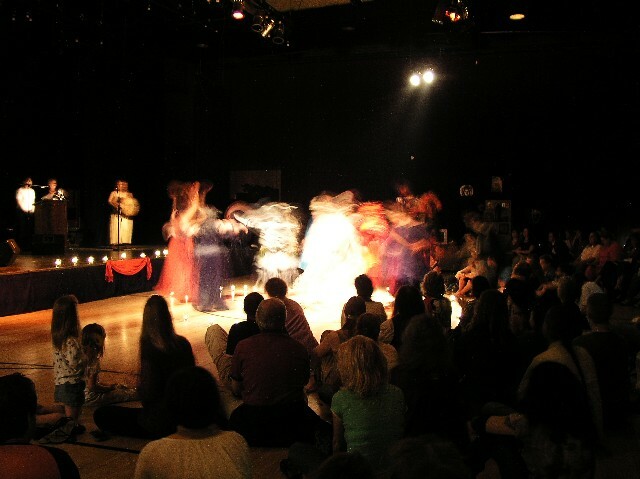 For that brief while, as the entire room chanted "All One, All One" everyone there was connected to threads that were held by cast and audience, extending to the last aisle. 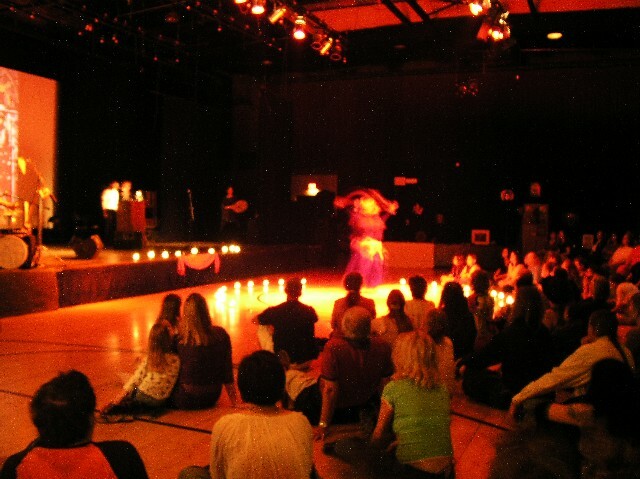 Morgana, aspecting Spider Woman and acting as a "filiment" at the center to raise the energy with the audience that will release the prayer/intention of the ritual, also seems to disappear in light. 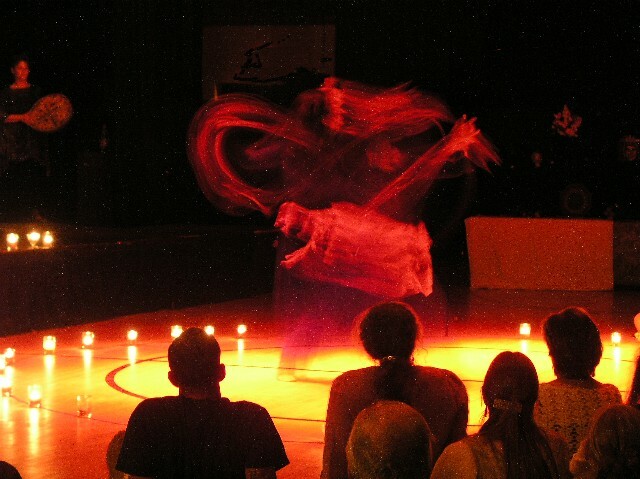 Here Morgana prepares to "weave", building energy. Here's the Web made of strands of cord being created with the audience. Shapes that obscure a shot of the audience during the "weaving" segment - looks a bit like a hand to me. Why were we given these spirit photos? 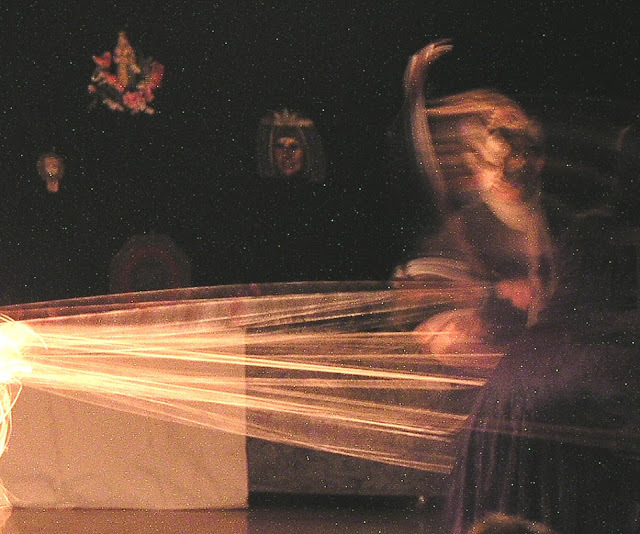 I believe because Spirit wants us to know that we don't create sacred performance, ritual, or art alone. We are given "invisible means of support". Also, because the message that Grey Eagle (who passed away in 2006) gave us about Restoring the Balance with Mother Earth, and the return of the Divine Feminine is profoundly, profoundly important. They want us to pay attention. So, there's my "homework" Lonnie. And as before, I am truly grateful for all the support I have received in all ways. Blessed Be on Mabon, the Autumnal Equinox. *** Whenever I touch on this work, it always gets very synchronistic. As I was beginning to write this article this morning, out of curiosity I googled "Restoring the Balance Ritual" to see if my previous article came up quickly on the internet. My article came up number one, and after it a native American based site called "Earth Mother Crying" (http://www.earthmothercrying.org/Prophecy.htm) (remember that the story of Sedna concerns Sedna crying and suffering beneath the ocean, and her Shaman going to comfort her). If that wasn't enough, there is a rather long quote from a teacher (I want to investigate who he is further) called "Grey Eagle" on the page above. He talks about the "5th Hoop" ..... which gives me insight into my long art project, the Rainbow Bridge. And whoever is writing in the site talks about the importance of the return of the Feminine, and says that a great healing is going to start in Alaska! Ok, my attention is fully engaged now, and I'm going to pursue this more in the future. But for now, I need to close, but copy below a few words from the site above, which has provided me with such a splendid synchronicity. The signs of this time of healing that is to start are: When the children bring back the spirit to the village; when the young start speaking with the wisdom of the elders; when the leadership energies start shifting to the feminine side; when this hoop of the 100 eagles feathers gets completed. And when the White Bison shows up. These are all the signs of the movement from the 4th to the 5th Hoop. Your intuition is going to tell you what I am saying is true. The world for the last 4,000 or so years has been stuck in the male energy side. The male energy is thinking from the brain. It is a management from the top down. It is more aggressive. It does not use intuition or feelings from the heart. It is a different kind of energy. It is not a bad energy. It is just different than the female energy. Female energy is healing, nurturing, loving, caring, touching, sharing. The world spiritual leaders know now that these energies have shifted to the female side. "Blue Thunder, Teacher from among the Eastern Shoshone people, sent this significant message from Grayeagle from the Yukon Territory of Canada." A tone poem Sig Lonegren wrote .........rediscovered it and felt like posting it. and, of course, it is true. Calendar II in Central Vermont, USA. It's the Nature of Sacred Space. is that everyone who goes there sees Spirit differently. Dowsers are the same. . .
when dowsing in sacred space. not to mention "energy lines"
What s/he's ready to "see." Hmm. . . Who decides that last one - what we're ready to see? Not some dumb energy with no consciousness. But the Energy of Spirit with total eternal consciousness. Actually, going to Michaels is just fine with me from now on in. By the way, is there anywhere in the Bible where Jesus says that women not have access to birth control? What's next, a new Inquisition? Hobby Lobby, an arts and crafts retailer founded by evangelical Christians, just announced that it's suing the government over certain women's health provisions of the Affordable Care Act--mainly, they don't want to have to provide their employees with insurance coverage for some forms of birth control, like IUDs or the morning after pill. If they win, the result could be devastating for women, enabling other businesses to deny female employees birth control. We've got to speak up. 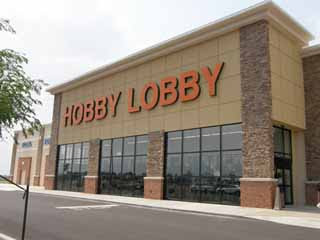 Hobby Lobby is a business like any other, and depends on its customers and good public relations to be successful. If enough of us speak out and show Hobby Lobby's Chief Executive David Green that the public is outraged by this move, they might have to back off, and it might make other companies less likely to try the same thing. "All women deserve affordable access to birth control and its a woman's personal, medical decision on which form to use. I won’t be shopping at your store until you drop this suit, and I’ll be telling my friends to do the same." of unfathomable destruction yet to come. always new, always cold, always blue. Gaia. Her manifest, unspoken words. between sky and sea and land. He is taking himself back. sharing this rite of remembering. Yesterday, and 30 years ago. A river Goddess with no name. of sticks and sand and seaweed. and the summer of love. I call you back, girl. "Butterfly Woman mends the erroneous idea that transformation is only for the tortured, the saintly, or only for the fabulously strong. The Self need not carry mountains to transform. A little is enough. A little goes a long way. A little changes much. The fertilizing force replaces the moving of mountains. 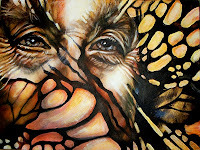 Butterfly Maiden pollinates the souls of the earth: It is easier that you think, she says. She is shaking her feather fan, and she’s hopping, for she is spilling spiritual pollen all over the people who are there, Native Americans, little children, visitors, everyone. This is the translator of the instinctual, the fertilizing force, the mender, the rememberer of old ideas." Clarissa Pinkola Estes, "Women Who Run With The Wolves"
I had a strange synchronicity that has personal meaning for me, although I am not sure I can convey it well to others. When things like this happen I consider them not to be dismissed as if i get that "ah ha" feeling. The power of the message has to do with what is going on in one's life at the time, as well as one's personal symbol system. Interpreting synchronicities is much like interpreting dreams to me, both universal and very personal. I've written about this before. This one, for me, is a reminder. In 2003 I started gathering materials for my book about the Masks of the Goddess, their travels throughout the U.S., and the stories and people who told them and danced them. I was writing about two masks, the amazing story of the Cornmother mask, and another mask I made, Butterfly Woman, based on readings of Clarissa Pinkola Estes about the Hopi. I remembered that Christy Salo (whose story is below) told me that she had, in the course of gathering materials for her performance as Selu, met a Hopi woman who was visiting Isis Oasis, and that she had given her some 300 year old sacred cornmeal to bless her performance. I wrote to Katherine** in 2003. She has worked with Hopi elders and activists, and founded a non-profit in San Diego called "Touch The Earth Foundation" back in 1993. 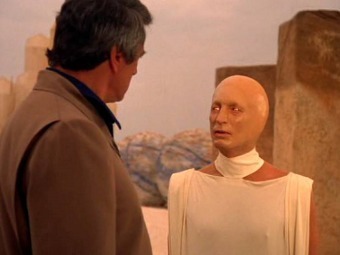 I hoped she would tell me more about why she felt moved to offer that corn meal, and also hoping she would tell me about the Hopi Butterfly Woman. I never heard from her, and the book was eventually finished. And then, out of the blue, almost 10 years later, she answers me! 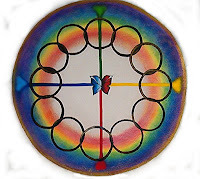 Reading Katherines words about her foundation work just today (I knew nothing about her other than that she gave corn to Christy and was Hopi) I was surprised to see that she wrote about "rainbow hoop" work with diversity groups - and her logo is at right. That concept of the "rainbow corn", like the coming "rainbow tribe" was why I painted a rainbow on my mask.....but until this month, I have never seen her logo or read anything by her. 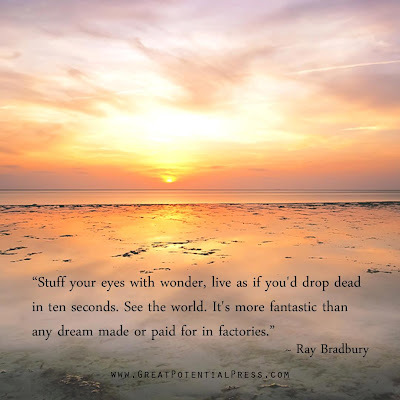 I feel heartened by this, because it remembers me to the interwoven threads that connect us all beneath the surfaces of things. It encourages me in mythic work, and that of my colleagues, women and men. And I thank the Goddess, in all of Her many forms, for weaving these messages through us all. Butterflies are not only ephemeral creatures that embody the perfect metaphor for transformation. They are the final life stage of the caterpillar, responsible for laying the eggs that will ensure future generations of butterflies. They are generators of the future, because as Pollinators they must also see to it that not only caterpillars, but many other kinds of life are able to have a future. Just as diminishing populations of honey bees threaten the food crops, so too are these creatures potent. What is the pollen? The pollen that generates new civilizations, and new paradigms......that pollen is made of stories. "And here too come visitors to the dance, some of whom are very starved of their geno-myths, detached from the spiritual placenta. They have forgotten their ancient Gods. They come to watch the ones who have not forgotten." In "Women Who Run With the Wolves", Estes tells of the Butterfly Dancer, slow, sure, with her traditional tokens of empowerment. "She is La voz mitológica" Estes reminds us, the "Mythic Voice". What's a mask? 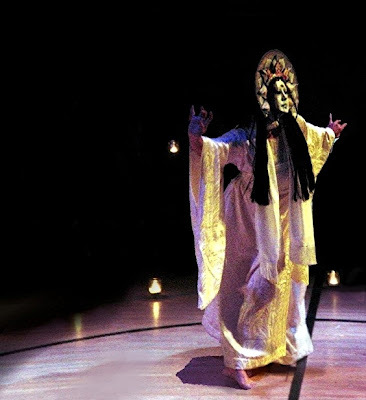 A mask is a way to invite a persona, or to "invoke" (join with) an archetypal being, to express within oneself and within the collective experience of ritual and theatre. In the early days of theatre, whether in Greece or Japan, all actors used masks. To wear a mask that is deeply archetypal, such as the mask of a Goddess or God or an animal power (as contemporary participants did with the masks in my "Masks of the Goddess" collection) is, within indigenous traditions, to "bring the deity to Earth" to bless, prophesy, and instruct, to tell the sacred stories and legends, and to enliven and "seed" the imaginations of those present. So back to my book about masks, and my 9 year old email to Katherine, just now answered. mean time rest assured i will help you if i can. I know you don't remember me, but I met you in the Spring of 2002 when I was organizing, with others, an event with my Masks of the Goddess in Oakland. I write for two reasons: one is gratitude, because you gifted a dancer with some sacred corn, which was used, as a blessing, in a performance devoted to Selu, Corn Mother. I take the liberty of copying below this quite magical story, which is included in the book I'm writing. The other is that I have made a Butterfly Woman mask. 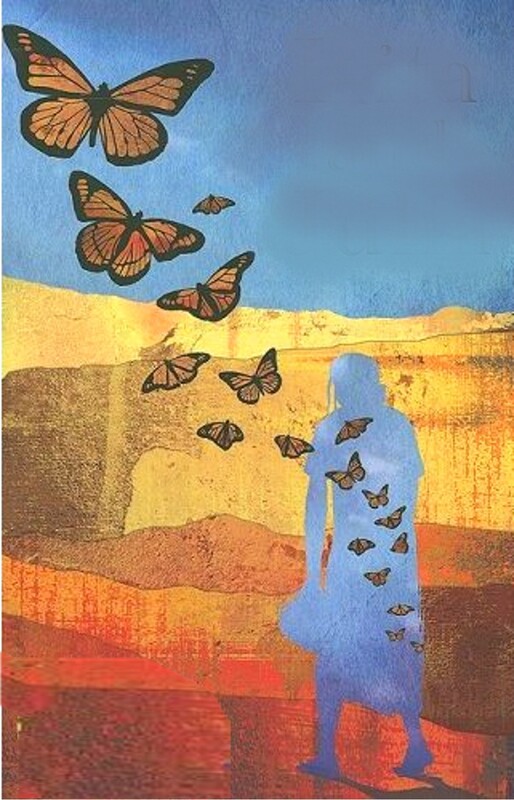 It was inspired by Clarissa Pinkola Estes story of the Butterfly Dancer among the Hopi. I know nothing about the story of this Goddess. I know you are a very busy woman, but I thought I might as well ask if you have any interest in writing something about Her story, or meaning? I have no publisher as yet, but am submitting my book, and have good faith that it will find a publisher, and I can offer contributors publication, exposure, and referral when that happens. 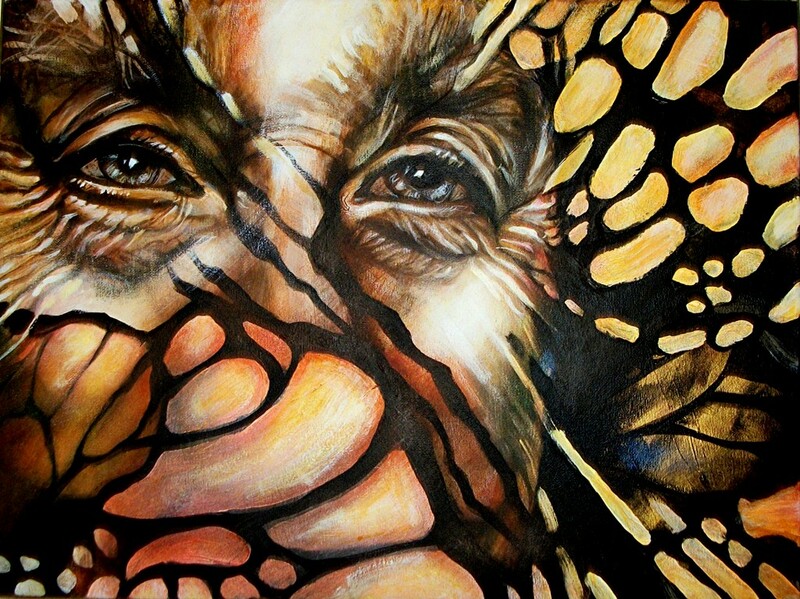 Marilou Awiakta, "The Corn-Mother Incognito. Or Is She?" Corn is the staff of life for the people of the Americas, and Corn Mother has many names. Among the Cherokee, Corn Mother is Selu. Selu's very body is the sustaining grain. The story of Selu, like the myth of Demeter/Persephone, is the death and resurrection cycle of the grain mother. But it is also, from the wisdom of the Cherokee, about understanding the reciprocal nature of being in right relationship with the Earth. Selu's sons, being ignorant, fearful young men, discover her secret. Selu knows this, and nevertheless compassionately teaches them to preserve the seed corn, her very essence. Selu's immature sons witness a mystery they are not able to understand, and make arrogant assumptions that bring disaster - the same human immaturity expressed by the forces of modernism that today bring destruction to the environment. The Mysteries of the Earth Mother are shared through reverence, cooperation, and a willingness to listen. In loving generosity, Selu offers her children another chance, to atone, to bring themselves back into alignment with the natural order. Perhaps, even now, Selu compassionately holds out to us the opportunity to weave our understanding back into "good relationship" with the elemental and diverse intelligences that are the vast web of life we participate within, the past, and the future we co-create. Indigenous cultures understand that we are engaged in a quiet, mythic, and miraculous Conversation with nature. There is a message in the sudden flight of a bird, an answer to their questions in the vision granted by a sacred place, or synchronicities that guide the way to an important revelation. At times, we are "seeded", we are generously given kernels to nurture us, and to pass on. I like to think the rainbow mask of Corn Mother was such a seed from the hand of Selu, graciously instructing us on how to dance. I had given masks to choreographer Manna Youngbear, who was directing a ritual performance at a theatre in Oakland. Several weeks before her event, I attended a group meditation. As I sat cross-legged on the floor, I found myself absorbed by a vision that had nothing to do with the ceremony I was participating in. When I closed my eyes I saw a Native American woman wearing a deerskin costume. She was dancing with an ear of corn in each hand. I opened my eyes to a room full of meditating people, then closed my eyes to again see her dancing to a chant I could almost hear, ears of multi-colored corn shining in her hands. 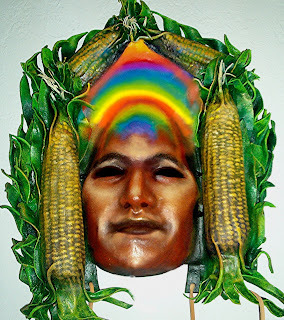 When I returned to my studio, I made a mask, and placed ears of corn on each side of the face. A friend had just given me a little prism, and as I worked on my new mask, it cast lovely rainbows around the studio. I had been reading about Black Elk, the great Lakota shaman. As a young boy, he foresaw the destruction of his people, the "hoop" of the Lakota nation. But he also prophesized a future "hoop of the nations": a great circle, composed of many interlocking circles. A Rainbow Tribe encompassing people of all colors. It seemed to me that Corn Mother, who nurtures all of Her diverse children on Turtle Island, was at the very center of Black Elk's vision, and so I painted a rainbow on the mask's forehead. "When I held up an ear of calico corn" Cherokee poet Marilou Awiakta wrote, "we would think about this wisdom of the Corn Mother. How the different kernels are ranged around the cob, no one more important than the other. How each kernel respects the space of those on either side, yet remains itself - red, black, white, yellow or combinations of those colors. How the Corn-Mother, in Her physical being, exemplifies unity in diversity, "from the many one" - democracy." Just before her performance, I learned there was one dancer in Manna's cast who had no mask. Christy, who had created a dance for Green Corn Woman. Now she had a mask - and when Christy danced, she blessed the audience with corn meal she received from a native American teacher. I made a bouquet of corn for Manna and Stephen's wedding, with a necklace of rainbow beads on it I bought at a garage sale. I used this same bouquet to dance Green Corn Woman at our performance. The wedding was at a retreat center in Geyserville, California. After the ceremony, I met a woman walking about the property. She told me she really didn't know why she was there! She had been heading to Oakland, and felt an urge to turn off the road. When she drove by the sign for the center, she impulsively pulled in as well. And there she was, in a lovely place with a wedding in progress. As we talked, I recognized she was the woman I had bought the rainbow beads from, the same beads that were decorating Manna's bouquet, even as we spoke! She was a touchstone on my "journey to Cornmother". When Manna cast her show, she asked if I wanted to dance Corn Mother. Manna is part Cherokee, so perhaps that was what she was thinking about. I had been making collages with corn in them for years, and it seemed right. We didn't have a mask for the Corn Goddess, but I was inspired to create a dance anyway. I knew very little about the Native American Corn Mother. I intended to visit the library, but a friend turned up with a wonderful book called BROTHER CROW, SISTER CORN that was full of indigenous corn legends. I also stopped at a used bookstore, and opening a rather esoteric book at random, discovered I was looking at an article about the Corn Maiden. I was further stunned to find it was illustrated by Vera Louise Drysdale. Vera was the first woman I met, years ago, when I lived in Sedona. I was ready to begin. Corn Mother among the Cherokee is called Selu, a funny synchronicity, as my own last name is Salo. I felt I was following an invisible thread - and the feeling of familiarity continued as I created a costume. I was looking for materials I associated with Corn Mother, and a few days later, Manna left me a message. "Christy" she said, "There is a Hopi woman at Isis Oasis you need to meet! She gave me some 300 year old corn meal to give to you!" I felt the spirit of Corn Woman encouraging me! I thought about what She personally meant to me. Corn Mother is about the wealth that comes from the work of forgiveness. How can we be fed and sustained, how can we create peace, if we cannot learn the lessons of forgiveness, if we cannot learn tolerance for our differences? That is the beginning place for the cooperation we will need in order to evolve. I've always conceived of the Rainbow as actually being a circle. Half of the rainbow disappears into the ground, into an underworld realm, where it exists beneath the Earth, hidden, but present. Like the Corn Mother. And aren't we all Her children? Especially in America, where we have come together with our mixed bloodlines: we all have "rainbow blood". I believe our challenge is to understand our true relationship to each other, to widen our vision to see the future Black Elk prophesied, the creation of a Rainbow Nation. We received the new mask around the time of the lunar eclipse, in May of 2002, and decided at that auspicious time to consecrate it with some dried corn. As we did, a flash of light went off in the room! At first we thought it was a light bulb that blew out, but looking around, realized there were no electric lights that had been on in that room. We looked at each other amazed, and we felt the presence of Corn Mother. **Touch The Earth Foundation was founded in 1992 to provide education and instruction in cross-cultural customs and beliefs. 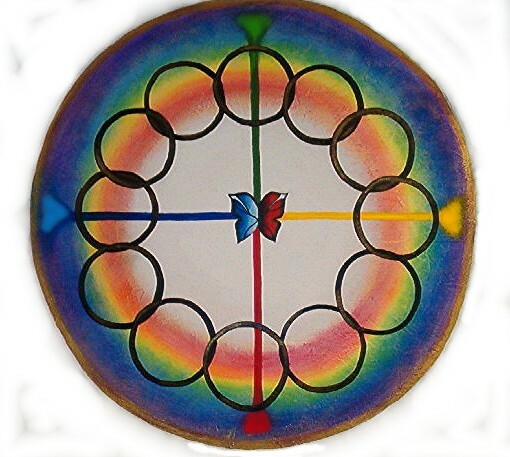 "When we open a door, such as a “Medicine Wheel”, we must be mindful that the spirits are of our pure intentions; they are gifted and hosted with corn meal or tobacco in some parts of the world. Then, after the ceremony, give thanks and close the door behind you so mischief will not change your intentions of Universal Balance and Peace. Think of Brothers from Tibet, they often make Mandalas and often they take many days, even months, to accomplish. And after the ceremony the prayers and divine message and Mirror to the Universe is destroyed and returned to Mother Earth as the Reflection is already in the other worlds. We live in the world of temporality and so it must be destroyed so the intention will not be misused or become stagnant."